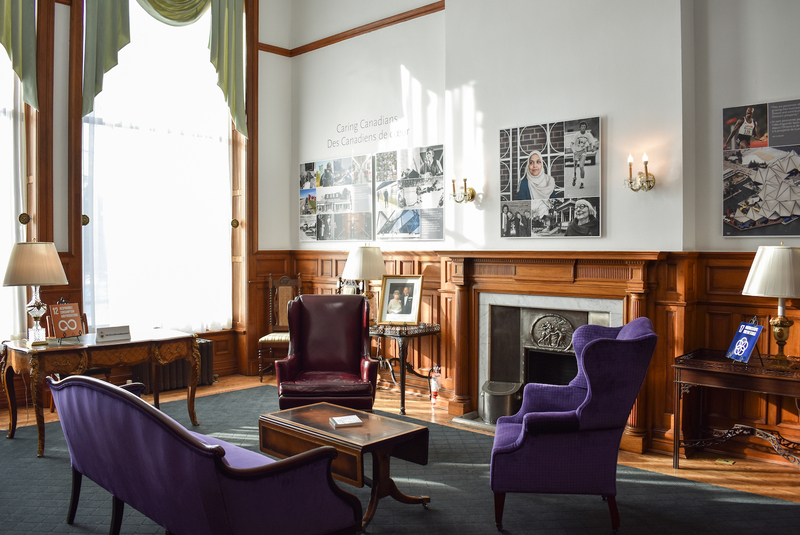 Members of the public may tour the Lieutenant Governor’s Suite on selected weekdays during guided tours of the Legislative Building. Tours last approximately 30 minutes, which includes a visit to the suite. The Lieutenant Governor’s Suite is a working office, and official functions may limit tour availability. For more information about confirming tour availability, check the Legislative Assembly’s website. The Lieutenant Governor’s Suite comprises several state rooms and offices inside the northwest wing of the Legislative Building at Queen’s Park in Toronto. It is a working office and serves as the setting for official functions and hospitality. The Lieutenant Governor’s Suite is the venue of many significant constitutional events, such as the appointment and resignation of Premiers, the swearing-in of ministers, and the granting of Royal Assent. It is where the Lieutenant Governor hosts foreign heads of state and government, diplomatic and consular representatives, and distinguished visitors. The suite is also a place for the Lieutenant Governor to host community groups for awards ceremonies, receptions, and meetings. The Lieutenant Governor has operated out of the Legislative Building since 1937, following the closure of Government House at Chorley Park. The suite occupies the former site of the Speaker’s apartment and Cabinet dining room in the Legislative Building, which were renovated for use by the Lieutenant Governor. The first public event in the new Lieutenant Governor’s Suite was hosted on May 4, 1938. In 1939, King George VI and Queen Elizabeth visited the suite. Since then, The Queen and most senior members of the Royal Family have been frequent visitors when in Toronto. The foyer is the main entry to the Lieutenant Governor’s Suite and leads to the lounge, drawing room, and dining room. Visitors are greeted by portraits of The Queen and The Duke of Edinburgh, and the Lieutenant Governor. A large portrait of Upper Canada’s first Lieutenant Governor, John Graves Simcoe, painted posthumously by Sir Edmund Wyly Grier, appears on the wall on loan from the Toronto Public Library. The oak hall table, console tables, and crystal chandelier come from Ontario’s former viceregal residence, Chorley Park. The focal point of lounge is a stone fireplace surrounded by furniture from Chorley Park. The Lieutenant Governor hosts official and informal meetings in this warm, wood-panelled room, which is also open to visitors during receptions. The lounge features the desk of the Hon. Pauline McGibbon, Ontario’s 22nd and first woman Lieutenant Governor. The drawing room is an elegant venue and the frequent setting of receptions. The settees, armchairs, side chairs, and window seat, designed in the Louis XVI style, were purchased in 1915 from the T. Eaton Company for the former viceregal residence at Chorley Park. During the end-of-year holiday season, a decorated evergreen tree is displayed in this room. The dining room is the setting for formal luncheons and dinners hosted by the Lieutenant Governor. Sliding doors can be opened so that large dinners and receptions can extend into the adjacent drawing room. The oak table, chairs, and sideboard, all designed in the 17th-century Jacobean style, were made in 1915 for Chorley Park. Lined by portraits of former Lieutenant Governors, the staircase connects the foyer to the landing on the second floor. The landing serves as an informal sitting area for guests. On display are portraits of former Lieutenant Governors. Doorways lead to the music room, the Lieutenant Governor’s private office, and work space for staff. The large red banner with the cypher and arms of George IV dates from the 1820s. The banner was originally created for George III, and was already en route to North America at the time of his death. Rather than replacing the III, made of expensive gilded silver wire, with IV, an additional roman numeral I was added, rendering the cypher as G IIII R.
The music room, the largest room in the Lieutenant Governor’s Suite, is the setting of awards ceremonies, swearing-in ceremonies, musical performances, film screenings, large receptions, and the Lieutenant Governor’s New Year’s Levee. The Diamond Jubilee portrait of Her Majesty The Queen is featured above the fireplace, and portraits of the most recent Lieutenant Governors hang on the walls. The piano in the alcove give the music room its name. Most furnishings, and the chandelier, came from Chorley Park. The colourful wool carpet was installed by hoisting it in through the alcove window. The fireplace has an oak mantelpiece with a Latin inscription meaning “These things one day it will be pleasant to remember”. On special occasions of a less formal nature, this room is adorned with couches and coffee tables, sometimes with a DJ or live musician providing entertainment. The office is the venue for official business and informal gatherings. In this room, the Lieutenant Governor may grant Royal Assent, hold audiences with the Premier and official visitors, and sign government documents. The office is adorned with art from the Government of Ontario Art Collection. The viceregal standard is displayed along with the flags of Canada and Ontario. Art exhibitions are periodically commissioned to be featured in the Lieutenant Governor’s Suite. Almost all jurisdictions of the Commonwealth Realms maintain an official residence, known as Government House, for the Sovereign and her or his representative. These often historic venues provide an official residence for government business, ceremonies, receptions, and guest accommodations. From 1870, Ontario’s Lieutenant Governors lived, worked, and hosted events at an official residence at King and Simcoe Streets in downtown Toronto. From 1912 to 1915, the Lieutenant Governor took up residence in Pendarves at St George and College Streets. In 1915, the Lieutenant Governor moved to Chorley Park in Toronto’s Rosedale neighbourhood. During the provincial election of 1934, Premier Mitchell Hepburn campaigned on closing Government House as part of a reduction in government expenditures, and Chorley Park was forcibly closed in 1937. Chorley Park, Ontario’s last Government House, takes its name from a tract of land in north Rosedale on which this impressive mansion was built. Designed by the province’s chief architect, Francis R. Heakes, in the Loire Valley Chateau style of architecture, the building cost well over $1 million. Its history was brief: after barely 22 years, the provincial government considered Chorley Park too great of an expense. The property was sold and the residence’s contents were auctioned off in 1938. Some of the most impressive features of Chorley Park were moved to Queen’s Park, including six crystal chandeliers, a collection of paintings of Ontario’s Lieutenant Governors, and purpose-built furniture provided by the T. Eaton Company. Lieutenant Governors Sir John Gibson and Sir John Hendrie briefly occupied the building known as Pendarves at St George and College Streets until Chorley Park opened in 1915. Now known as Cumberland House, it is the location of the University of Toronto’s Centre for International Experience. Upon Confederation in 1867, the provincial government saw the need for a Government House in the “grand manner”. What has now come to be called “Old Government House” was erected at the cost of just over $100,000. Its modern French style was designed by the Toronto firm of Gundry and Langley. The building was occupied in 1870 by William Pearse Howland. Old Government House was situated on the site of the old Elmsley House at King and Simcoe Streets. On alternate corners were Upper Canada College, The British Saloon, and St Andrew’s Presbyterian Church. Not surprisingly, the area came to be called “Education, Damnation, Legislation, and Salutation”. The house remained the official residence until 1912, when the area was deemed inappropriate due to the growth of nearby commercial structures and railway tracks, and the fact that the Legislative Assembly had moved into the new building at Queen’s Park. The site was sold to the Canadian Pacific Railway and the building was demolished in 1915. Elmsley Villa was occupied by The Earl of Elgin and Kincardine, Governor General of the Province of Canada, from 1849 to 1851. Beverley House was, for a time, an official residence. It had been purchased in 1817 by Sir John Beverley Robinson, and was occupied by Lord Sydenham from 1839 to 1840 when he came to Toronto to implement the union of Upper and Lower Canada. This residence was later turned over to the Robinson family, who occupied it until its demolition in 1912. Following the war, the government purchased Elmsley House, the residence of Chief Justice John Elmsley, converting it into the official residence of the province. It was located at the south-west corner of King and Simcoe Streets. It served as Government House until 1841 and had been used by Francis Gore, Sir Peregrine Maitland, Sir John Colborne, Sir Francis Bond Head, and Sir George Arthur. In 1800, the first public funds were expended for a new Government House. This U-shaped one-storey structure was designed by Captain Robert Pilkington, and was situated near the French Fort at the western end of town. This residence was occupied by Peter Hunter, Alexander Grant, Francis Gore, Sir Isaac Brock, and Roger Hale Sheaffe. In 1813, the residence met its demise by explosion during the American invasion of York. John Graves Simcoe’s successor, Peter Russell, occupied his own house, Russell Abbey, located at the south-west corner of Princess and Front streets. In July 1793, John Graves Simcoe sailed to the town of York (now Toronto) to establish a new capital for Upper Canada. For two years, he took up residence in a tent or canvas house in the neighbourhood of the old fort at the entrance to the harbour. In 1795, Simcoe built a summer home, naming it Castle Frank to honour his eldest son and heir, Francis. No public money was expended during the construction. The cottage was built of of logs covered with clapboards, built along the Grecian temple plan, which was a style popular at that time. The drawing by Mrs. Elizabeth Simcoe shows that the residence must have commanded an impressive view of both town and the Don River. Castle Frank stood until 1829, when, deserted and uncared for, it was destroyed by fire. In July 1792, Upper Canada’s first Lieutenant Governor, John Graves Simcoe, arrived at Newark (now Niagara-on-the-Lake), the province’s original capital. Navy Hall was the first official residence, even though it was also used as the original meeting place of Upper Canada’s Legislature.